Day after split of Zionist Union, Labor gets 8 seats and Livni's 'Hatnua' 5. Likud gets 31, according to poll. 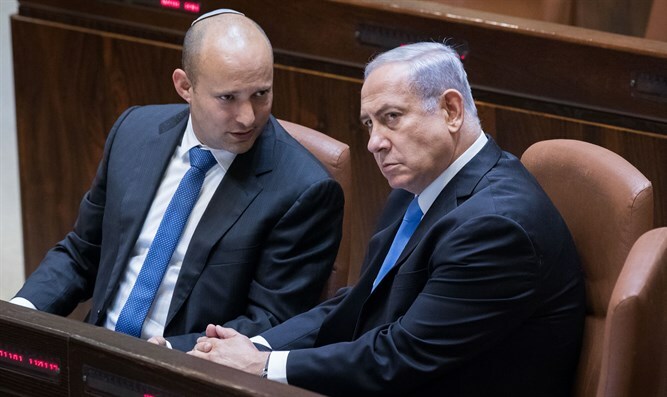 A poll by Hadashot news agency published Wednesday shows a rise of two seats in the right-wing bloc since the dismantling of the Zionist Union and the departure of Bennett and Shaked from the Jewish Home. According to the poll, the Likud party gets 31 seats, Benny Gantz’s “Hosen LaYisrael” list gets 12 seats, the Joint List 12, and Yair Lapid’s “Yesh Atid” list wins 10 seats. The Labor Party, headed by Avi Gabbay, receives 8 seats, United Torah Judaism 7, Bennett and Shaked's New Right 6, “Kulanu” 5. "Yisrael Beytenu" and the "Gesher" list of Orly Levy Abecassis receive 5 seats in the poll, the Meretz party 5, Shas 5, Tzipi Livni's “Hatnua” wins 5 seats and the Jewish Home 4 seats. The poll was conducted by the Midgam institute in cooperation with iPanel of Dr. Mina Tzemach and Mano Geva, among 515 respondents in a representative sample of the total population in Israel aged 18 and over. The maximum sampling error in the survey is +/-4.4%.